What’s Your Exercise Prescription for 2016? We all hear that we should be doing more exercise. But what type and how much? With a new year comes new goals and new motivation. In 2016 don’t leave work to go home and embrace the sofa. Take a walk, swim or run. Do some Pilates to keep your body balanced, get out in the garden and “smell the roses”, lavender, herbs or whatever you love to grow. Go for a walk in your lunch hour to break up the day and “get the blood” flowing. Physical activity is your best friend! The biggest problem of the 21st century is physical inactivity, according to the World Health Organisation (WHO). Everyone wants to live a long and productive life and maintain quality of life into their twilight years. Very convincingly, the data suggests that physical activity is your best friend when it comes to reducing morbidity and mortality rates. Aging is a complex process of interacting physiological mechanisms that tend to see a slowing metabolism, increased blood pressure, a decrease in cardiovascular fitness and overall muscle mass. In addition, we see changes in cognitive function and reduced bone mass and lung compliance. If that is somewhat confusing, it basically translates to worsening balance (and hence increased falls risk), a reduction in strength/power performance, smaller/weaker muscles and slower brain processing. This doesn’t sound like much fun but take consolation in the fact that exercise and physical activity can mitigate these deficits. Those people who are moderately fit in the cardio respiratory (CR) category, will live a longer life than their sedentary or low fit counterparts. The evidence categorically proves that being in a moderately fit category, or higher, will have a better outcome in terms of mortality and morbidity. The table below demonstrates the rates of attributable deaths to various physical co-morbidities. Being in that low CR fitness category will increase your mortality rates more so than having diabetes, being obese, having high cholesterol or increased blood pressure (hypertension). The only thing that comes close to low fitness in contributing to high mortality rates is hypertension. Equally with aging, for those that are moderately fit, have lesser mortality rates than those who are the same age, or even younger, but are sedentary or in the low fitness category. The recommended dose of physical activity as suggested by the WHO is 150 minutes of moderate intensity aerobic exercise per week, or 75 minutes of high intensity aerobic exercise per week. In addition to this, 2 sessions of resistance/strength training per week are advised. Whilst this is the minimum recommendation, there are additional health benefits if you can do more than double the recommended amount. Indeed leisure/physical activity time was observed to be of no added risk of mortality when performed at up to ten times the recommended amount. It’s obvious then, health professionals and we especially as Physiotherapists, should be encouraging the aging population to perform physical activity. In addition, we do not need to discourage adults who already participate in high intensity exercise for fear it may be detrimental. Recent studies indicate core strength training (CST) is associated with variables of static and dynamic balance and functional performance. 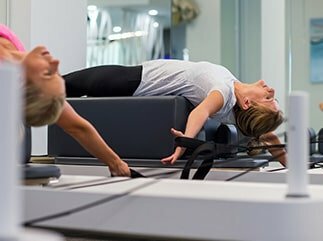 Initial data on Pilates training suggests that it may have a positive influence on strength, balance, functional performance and falls. Core strength training can be used as an adjunct or indeed an alternative to traditional balance or resistance training for older adults. Looking at the effect of Pilate’s exercises on falls risk factors 12 months after completing a 5 week exercise program; postural sway, dynamic balance and functional improvements are evident immediately post intervention and were maintained 12 months later. 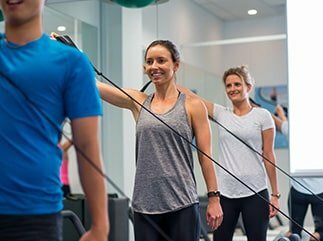 Significant differences existed between the group that continued with Pilates and those that didn’t. · reduced mortality and morbidity rates. We haven’t even touched on the psychological benefits of exercise but I hope we have convinced you that exercise is in your best interest to keep at least moderately fit and active during adulthood and particularly into the twilight years when physical activity becomes our biggest problem. So in 2016- make a new start and make exercise your first prescription!